Join as a Legendary member at the $5 monthly tier, and get items for Elite Dangerous, Runescape and more with your very first email. When you join the PC Gamer Club membership program at the Legendary tier, you get a host of neat stuff no matter where you're based: a Steam key every month for a different game (this month it's Cook, Serve, Delicious! ), an ad-free version of the site, our 25 year-old magazine sent to your digital device each month, access to our exclusive Discord channel, and a ceremonial wallpaper of Geralt from The Witcher series in the bath. We've also got a couple of surprises planned for December that we think our members will like. More on those soon. The things you can't get anywhere else, though, are the in-game items we send out, which have been created especially for us by a host of different developers. Today, we want to spotlight what they are, since we just added a new Elite Dangerous skin courtesy of Frontier. 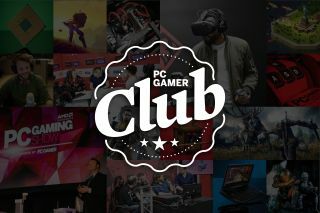 Here's everything you get in the welcome mail when you join the PC Gamer Club as a Legendary member. Originally given away for a limited time late last year, Jagex were kind enough to let us give away the Lycan permanently. Sign up now and you can get it straight away. The Fire Lycan evolves into the three forms you see above, from adorable fire dog to scary wolf that is nonetheless still cute, like all canines. Damn, they're pretty. Get PC Gamer-coloured skins for both the newer Krait Mk II and the Cobra Mk III (seriously, our art editor gave them the specific colour codes and everything). You can redeem these in-game or at Frontier's store. Full instructions come with your welcome email, and quickly you'll be flying around in PC Gamer red-and-black. This is a set of custom-made cosmetics for the factions in Tripwire Interactive's Rising Storm 2: Vietnam. For the US, you get a "Make Mods, Not War" helmet slogan that pays tribute to one of the best parts of PC gaming. For the PAVN, you get access to a bathtub tattoo, for no real reason. And for the Australian ANZAC forces, you'll get a tattoo of PC Gamer US's old mascot, Coconut Monkey. Being in the UK, we never got Coconut Monkey. Maybe we should've done a British equivalent—Tea Hedgehog? In multiplayer shooter Battalion 1944, you can get this Flight Springfield S rifle skin, which adds a bit of PC Gamer colour to your gun. Just don't think too hard about whether it's historically accurate (the answer is, it isn't).